When it’s a weekday and you come back from work to cook dinner, I’m assuming it’s not just me, you actually just want to relax. The cooking should be straightforward, ideally with minimal washing up and the food should be tasty, filling and balanced. I’ve been adding more and more recipes to my weeknight repertoire that are just that; minimum fuss, maximum flavour and ideally ready in under 30 minutes. 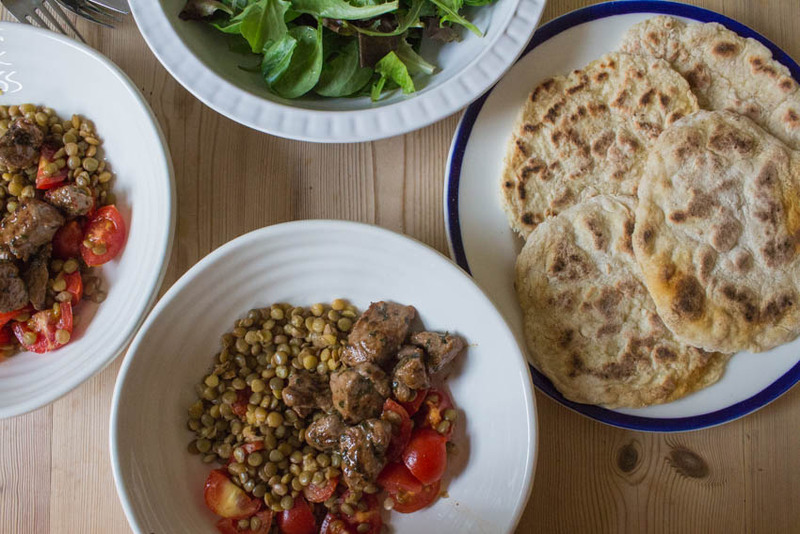 This recipe for lamb, lentils and flatbreads was another midweek success and is also part of an upcoming post about eating organic on a budget. Cook the lentils in vegetable stock according to the packet instructions. Make the flatbreads by mixing all the ingredients together until you have a dough. Divide the dough into four and roll out until about half as thick as a pound coin. Get a frying pan onto a high heat then add the flatbreads, one at a time, dry frying them until they are golden brown on both sides. Pop them into a low oven to keep them warm while you cook them all. Season the lamb on both sides. Get a frying pan on a medium-high heat with a little oil then add the lamb and fry until cooked through. Remove then slice up. Drain the lentils then mix with the olive oil, lemon juice and tomatoes. 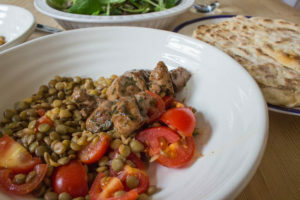 Top with the lamb and serve with the flatbreads and salad. 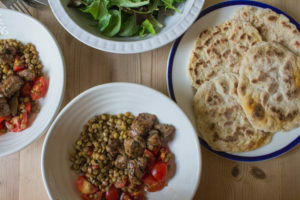 I have made these flatbreads before (they originally came from a Jamie Oliver recipe) and they are always good and can easily be made in the time it takes the lentils to cook. I only used two small lamb steaks; the lentils are really filling. It’s well worth cooking the lentils in the vegetable stock so give them a bit of a boost. The tomatoes, it helps if they’re really ripe, and the salad add a lovely bit of freshness and crunch. The best bit is the little bit of lentil liquid, tomato juice, olive oil and lemon juice all gather at the bottom of the bowl just waiting to be scooped up with a warm, crisp flatbread. I am with you – easy, no-fuss, but flavor-packed meals are the best! This is a great combination and so satisfying! You prepared bread from scratch, and cooked lamb..and this no-fuss? wow…I am not even sure I could do this on weekend, let alone weeknight..you are superb! Haha! No, I promise it’s minimum effort even though it looks like a lot more! Yup, we can all use quick, tasty, easy meal ideas. And I love lamb — one of my favorites — so this is right up my alley. Good stuff — thanks. WOW! This is such a flavorful combo. Loved it! Simple meals at the end of a long day are where it’s at! Love this idea! I don’t know what it is but lentils and lamb are a good compliment. You created a really tasty meal. What a glorious meal! I am a huge fan of lentils and need to add them to the menu more often! This is such a great meal, I would like to cook this. Thanks for the recipe. I cannot beleive you made flatbreads within a quick meal lol, and a really delicious one at that!